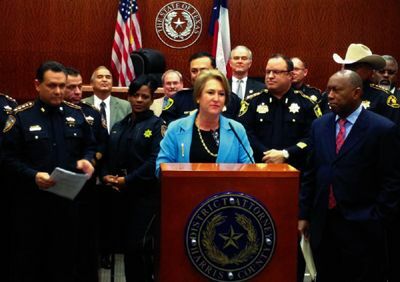 Harris County District Attorney Kim Ogg announced Thursday a new program to deal with cases of low amounts of marijuana that she described as part of a new era in the countys criminal justice system. Under Texas law, having four ounces or less of marijuana is a misdemeanor. Starting March 1st, people caught with that amount, or lower, will get a second chance before going to jail. You will be offered a chance to sign an acknowledgement form promising to take a decision making class, a cognitive decision making class. Takes four hours and costs $150. Youll be required to do that within 90 days, Ogg explained during a press conference held at the Harris County Criminal Justice Center, located in downtown Houston. One of the arguments Ogg made was the high cost of arrests and prosecutions for these types of cases. The District Attorney estimated the county spends about $26 million per year on misdemeanor marijuana cases. She also said the program is in accordance with Texas law because of the discretion prosecutors have. Kevin Buckler, an associate professor of Criminal Justice at the University of Houston-Downtown, agrees with the District Attorneys reasoning. Prosecutors have tremendous discretion in terms of filing charges, police have tremendous street-level discretion in terms of how they handle cases, Buckler said. Harris County Sheriff Ed Gonzalez praised the initiative and, on behalf of the City of Houston, Mayor Sylvester Turner and the Houston Police Department Chief Art Acevedo did the same. Acevedo thinks it can help his department improve public safety. What matters most to the people of Houston isnt somebody with a baggy of marijuana, what matters most to them is whats going on with burglaries of our residences, burglaries of our vehicles, armed robbery, sexual assaults. We are going to focus on being smart on crime, focused on crime, Acevedo commented at the end of the press conference referring to the possibility the program will help HPD use its resources more effectively. However, some members of the regional law enforcement community have expressed their opposition to the initiative. The Crosby community once again rallied and showed their overwhelming generosity and support of Crosby Fair and Rodeos TETWP event on Saturday, February 11, 2017 at the Crosby American Legion Hall. Preliminary reports show over $145,000 was raised at the 6th annual event. The committee chose a theme of Together We Can Make a Difference with all cancer recognized throughout the room with different awareness cancer colors. The theme was continued by the BFC committee ladies who chose a colored scarf to represent a cancer that has touched their lives in some way, through family, friends, etc. 100% of proceeds will benefit people in our community and surrounding areas that are fighting cancer. 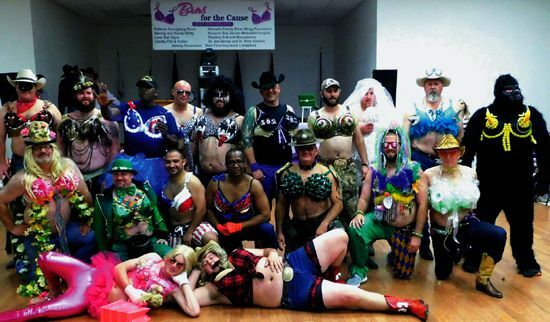 19 male celebrity models participated in a fashion show modeling bras designed by family and friends. Some of the themes included, the perfect little Barbie Girl (aka Jeffrey Sparks). Tyler Forrest was the Lone Ranger and Shannon Wilkes modeled in a gorilla suit with a theme of Bananas for Boobies. RD Burnside of Baytown, modeled a Bubble Bra, which was bought by Hotchkiss Disposal. Even CHS High School Teacher of the Year, Yancey Price joined in the fun and modeled The Luck of the Irish  Bra. Teaque Schexnayder modeled in his Daisy Dukes , which brought over $10,000. Teaques bra was bought by Oilwell Tubular. His cousin, Jacob Schexnayder, really got the party going with a Mardi Gras theme. Jacobs bra was bought by Johnathan Bohannon and Jeanne Shipp, co-founders/managing partners of Patients ER. They bought Jacobs bra for $25, 000 and Oilwell Tubular added another $10,000 on top of that! Charles Adams, Attorney/Partner and Host of Pursuit of Texas Radio, served as MC. DJ Jeff provided the music and Bill Busby served as auctioneer. Gary Clifton welcomed the sold out crowd, and David Bernard from Houston Methodist San Jacinto explained how Pink Heals funds have helped local people in the past year with day to day living expenses while receiving treatment for various types of cancer. Jennifer Loggins and Michele Eaglin served as photographers, and Demeris Catering provided the meal. The BFC committee is overwhelmed each year by the generous support of the Crosby Community and the willingness of men in our community to step up and model bras in support of local cancer patients. We feel blessed and very lucky to live in the community of Crosby. The stories that we receive about patients who have been helped through the proceeds of this event warms our hearts and confirms our drive to continue this great service for anyone in need. There were lots of smiles on Saturday night! Thank you Crosby Community! A DONKEY PLAYER scores a second basket as Crosby Fair & Rodeo members, like Coy Hearn, try to distract in an attempt to win a game without cooperative mounts. 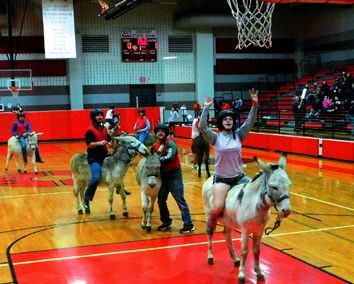 Donkey Basketball is like Polo is to soccer only with donkeys and no dribbling. Except the donkeys dribble a little. The quest is to make baskets and stay mounted. According to Chairman Wilton Schexnader, Our goal is to support Crosby F.F.A., teaching students Ag. Science, welding, mechanics, group involvement in numerous learning activities and basics in building knowledge, character and professionalism. KEMAH  The Crosby Volunteer Fire Dept. Annual Firefighters Banquet was held Jan. 28 and this year especially recognized the bravery of the people that rush in to confront danger when everyone else is rushing out. Guest speakers include the General Sales Manger of Turner Chevrolet, David Mendez, recounting his own experience in having his life saved by first responders. Randy Foster, ESD#80 Commissioer spoke of the progress and future development of CVFD. At Landrys Restaurant in Kemah at the Annual Firefighters Banquet Kevin Barker was recognized for heroism. 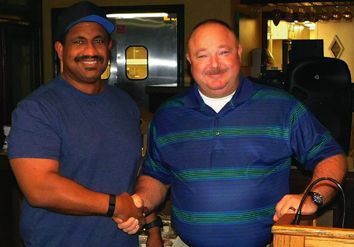 The award was presented by Russell White, who at the time had believed he was first at the scene when he saw Barker emerging with a man surrounded by smoke. Firefighter Kevin Barker may well have saved a resident Saturday, August 6, when he braved a fence, a dog and a locked door to get the man out of his smoking house. On his way to work the Crosby Volunteer Fireman saw a neighbors house smoking at about 4:28 p.m. on August 6. Barker was bitten three time by the dog and had to knock down the door to get a man out of a house that was about to erupt into flames. Neighbors say Jerome Ulrich had lived at the residence for decades. Harris County Fire Marshals investigated the blaze and determined that there was cause to do an extensive investigation, but it is safe to say if Kevin Barker had not come along on his way to work and been brave enough to withstand all the obstacles the result would probably have been tragic. The fire may have restarted in as many as three locations. An arrest for trespassing was done by Harris County Sheriffs Deputies of a couple found to be dwelling nearby behind the residence. The Harris County Fire Marshals Office were going to interview the couple however the initial contact Sunday morning found the two incapacitated. Lifesaving was the repeated theme of the banquet and the repeated service of the Ladies Auxilary went noticed early and long during the ceremony. When they give you a water, you better drink it. mused Russell White.